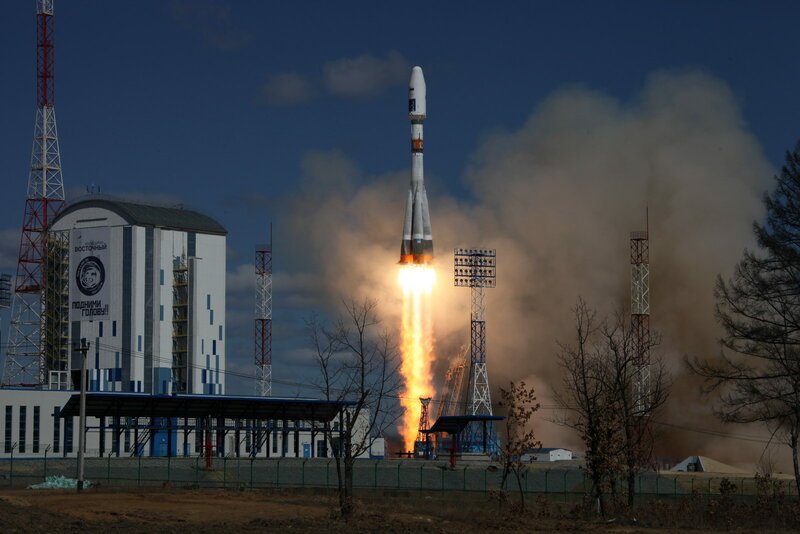 The Soyuz-2.1a rocket took off from the Vostochny Cosmodrome with three satellites at 0201 GMT Thursday (10:01 p.m. EDT Wednesday), one day after a technical glitch scrubbed the launch in the final minutes of the countdown. Vostochny’s construction began in 2011, four years after Putin approved the spaceport’s development. 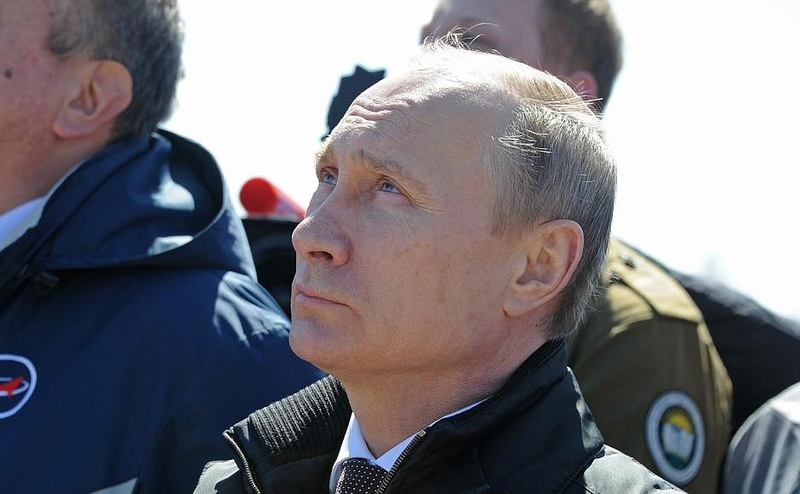 The cosmodrome has been one of Putin’s top domestic priorities, with an eye toward shifting more Russian space launches from the Baikonur Cosmodrome in Kazakhstan to launch facilities on the country’s home territory. Located in Russia’s Amur region near the Chinese border, Vostochny sits about 3,400 miles (5,500 kilometers) from Moscow, not far from an abandoned Soviet-era missile base called Svobodny, which itself hosted a handful of satellite launches. Vostochny will eventually have a launch pad for Russia’s future heavy-lift Angara rocket, a booster designed to replace the Proton launcher, and accommodations for human spaceflights. The first Angara launch from Vostochny is targeted for 2021 — all Angara test flights will take off from Russia’s Plesetsk Cosmodrome until then — and crewed missions could begin launching from the new cosmodrome in 2023, according to plans released by Roscosmos, the Russian space agency. Thursday’s launch is the only mission on the manifest at the partially-built cosmodrome this year, but its success offers a counter to critics who note construction delays at Vostochny and widespread corruption among the launch base’s contractors. Putin told reporters before Thursday’s launch that contractors found guilty of crimes will face prison sentences. “If their guilt of the suspected of crimes is proven, they’ll have to swap their warm beds at home for prison bunks,” Putin said, according to a report by Russia’s Interfax news agency. But the mood Thursday was one of celebration. Workers raced to complete the first phase of the Vostochny project in time for a first launch by the end of 2015, the date targeted when construction began, but officials in October delayed the Soyuz fight until this month as construction progress ran behind schedule. Facilities finished in time for Thursday’s liftoff included a satellite processing clean room, a hangar for assembly of Soyuz rockets, and the Soyuz launch pad at Vostochny, featuring a huge concrete flame trench and a mobile gantry with a mural of Russian cosmonaut hero Yuri Gagarin. Next up will be the completion of a space city with schools, mid-rise apartment blocks, rail and road links and other amenities for the cosmodrome’s workforce, which could number in the tens of thousands of engineers, technicians and support personnel. Building the Angara launch pad at Vostochny is also on the to-do list. The civilian-operated Vostochny complex covers an area of 270 square miles (700 square kilometers) — about the size of Singapore — and Roscosmos says it will cost 180 billion rubles, or $2.7 billion, when finished. The Soyuz-2.1a rocket — its engines guzzling a combination of kerosene and liquid oxygen propellants — took off Thursday and rolled on a course north-northwest from Vostochny, heading to a polar orbit with three satellites on-board. The launcher’s four strap-on boosters came off the rocket two minutes after liftoff, and moments later the Soyuz shed its aerodynamic nose done to reveal the three satellite passengers, all experimental spacecraft developed with the participation of Russian universities. 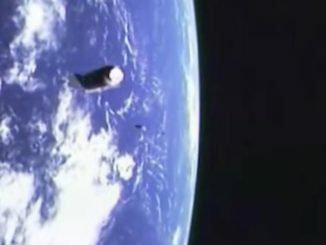 A Volga upper stage detached from the Soyuz rocket’s third stage less than nine minutes into the mission and started maneuvers to place the three satellites into orbit. The trio of payloads deployed from the Volga rocket stage 0407 GMT (12:07 a.m. EDT), Roscosmos said in a statement. U.S. military tracking data indicate the rocket put its satellite passengers into an orbit with a high point of about 300 miles (483 kilometers), a low point of 290 miles (468 kilometers), and an inclination of 97.3 degrees. Those parameters are close to preflight targets. 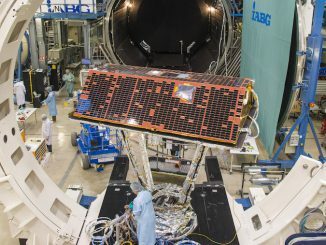 The largest of the satellites sent into orbit Thursday will study high-energy cosmic rays and gamma-ray bursts, the most powerful explosions in the universe, which astronomers believe come from the collapse of massive stars at the end of their lives. Named for Mikhailo Lomonosov, an 18th century Russian scientist and writer, the multipurpose spacecraft weighs more than 1,400 pounds (about 645 kilograms) and will also investigate Earth, attempting to pinpoint the origin of mysterious brilliant flashes of light in the upper atmosphere called transient luminous events. The flashes occur in milliseconds in a region of the atmosphere stretching up to 60 miles (100 kilometers) in altitude, making them hard to detect and study. But scientists believe they are linked to lightning in thunderstorms closer to the ground. 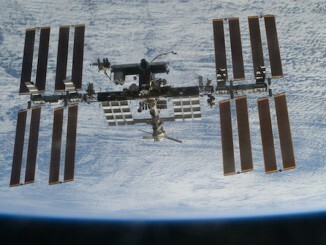 The Mikhailo Lomonosov satellite is designed for a three-year lifetime in orbit. A shoebox-sized CubeSat named SamSat 218 also launched aboard the Soyuz rocket Thursday. Built by students at Samara State Aerospace University, SamSat 218 will pursue educational and technological tasks, including tests in how to control tiny satellites in orbit.